This is just awesome! Who doesn't want a go??? This is Dirt Quake! from SIDEBURN on Vimeo. Yesterday was the June Back Road Riders ride and with new tyres on the DL I was dead keen to get out there and give the K60's a bit of a workout. Waking early to a semi-reasonable winter's day after a night of some serious rainfall was a positive start to the day and by 8:20 I was on the road heading for the ride jump-off point in Marton. I was well early so after arriving first set to twiddling my thumbs while I awaited the rest of the crew. Next to arrive was Colin and we had plenty of time to talk tyres (and possibly some nonsense) and get a picture of Team DL. With the arrival of a couple of rattly old DR's, a solitary Beemer and John on his nice new 650 Wee the gang was pretty much all there but for our leader...It turns out that Neil must have been wobbling all over the road when he left home in National Park as he was pulled over and breathalysed 3 times! Anyway a little later than planned we had our quick briefing and then made our way out of Marton. First up was some twisty tar taking us to Turakina Valley Road for our first little taste of gravel. Then we had another sealed section through to Hunterville on the great Mangahoe and Ongo Roads which actually had it's fair share of gravel on it in the form of roadworks and new seal. After a quick pootle up SH1 we turned off onto some more winding tar before tackling the spectacular Watershed Road. Watershed Road was just the first of some really good gravel roads that we'd ride and also took us up fairly high into the hills and gave us some great views - none of which I got on film as the GoPro was packing a sad and not giving me video or pics! Ridge Road North was another cracker of a gravel road as we got to first charge up the hill (no snow on the tops this time) before buttoning off a bit as we dropped back down into Taihape on Pukenaua Road. In Taihape it was time for some Soul Food before continuing on with the afternoon's adventures. After lunch we headed North for a wee bit before turning West on a delicious but too short gravel road and a big loop that eventually took us back onto SH1. Just South of Utiku we turned off again onto Manui Road for another big loop - this time West of SH1. Turning off Manui Road we hit what I think was my favourite road of the day - Te Kapua Road. This short stretch was in fantastic condition and charging up the hill you had good visibility of the coming corners so could really attack the road. The big DL really loved being given a few berries and giving 2nd gear a rest so that 4th could have a turn! Te Kapua Road deposited us back on SH1 where we carried on South in our only rainy spell before turning off onto Otara Road and leaving the rain behind us. This road can take you right through to Rangawahia Road (tar seal all the way) but naturally we turned off to take Mangamako Road which eventually goes to gravel on Waipuru, Mangapapa and Lower Pakihikura Roads - all fantastic gravel roads in good condition. Lower Pakihikura Road eventually ends on Vinegar Hill and that was the end of the gravel for the day. All that was left for us was to pop into Hunterville for a quick cuppa before parting company and making our way(s) home after another fantastic Back Road Ride! The Oxford heated grips on the Connie are now 82,000km old and the left grip has kinda got worn out and often gets sticky in warm weather. In other words, it's pretty stuffed. Mostly people seem to use these to make their handle bars a bit more comfortable and they reckon that the also help remove some of the vibes coming through the bars (not really a problem on the Connie). I thought that as you can fit them over heated grips that they may be a cheap way of prolonging the life of my hot grips. Getting them on was a bit of a task. I removed the bar end weights and lubed up the grips and the puppies with soapy water. It still was a fairly difficult task - probably a bit like getting Fat Albert into Paris Hilton's wetsuit - but after doubling the grips over I got them onto the bars and then was able to pull them by their edges (they are very strongly made) until they were in position. And so today I had the chance to give them a go. Even prior to fitting them I was concerned about them making the bars fatter in my hands and me losing some "feel" at the bars or even struggling to reach the levers. (I generally prefer to wear thin gloves whenever possible as I don't like the feel of thick gloves). I also wanted to test how well the heat came through the puppies. So on today's ride I left wearing my medium weight gloves (usually all I need throughout winter) and the grips definitely felt fatter in my hands. I ride covering my front brake with two fingers and this was slightly more difficult with the puppies on - I really only had one finger on the lever until I started braking. The clutch side was ok as I always use four fingers there. As far as the effectiveness of the heated grips through the puppies - I had to have the temperature on the 2nd highest setting (75%) to feel anything and even on 100% the grips were not too hot. I usually only need the 1st or 2nd heat settings (50/60%). As it wasn't too cold today I'm not sure what they'll be like on a really cold day. After a quite hard frost last night the day turned out to be a winter stunner - barely a cloud in the sky and the sun doing it's best to chase away the chill. After a lazy morning at home I decided that I just had to get out on the Connie to enjoy the lovely day. I decided on just a little ride but after a few km on the bike I was wishing that I'd left earlier and planned a longer ride - the conditions were just perfect and I was in love with my motorcycle. 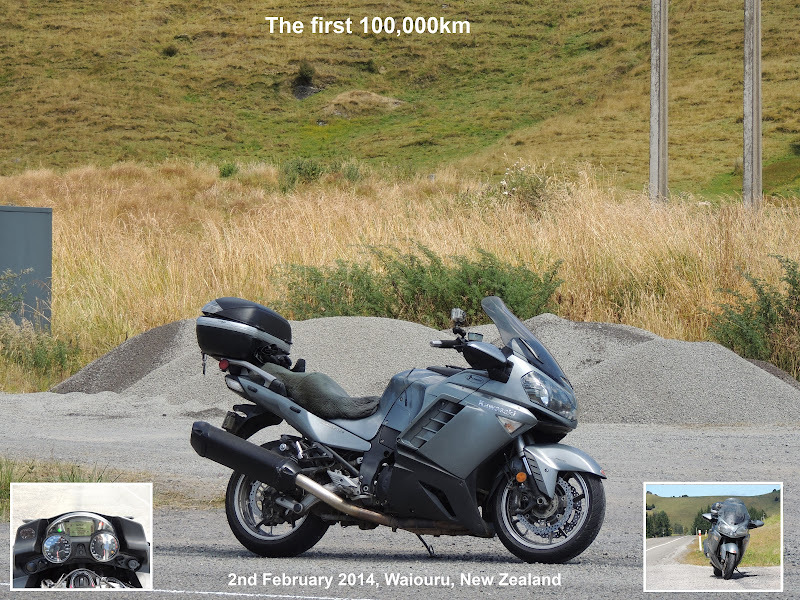 After a quick fill up in Fielding (where a number of other riders were doing the same - obviously wanting to make the most of the great day too) I made my way across to Halcombe and the turned North on SH1. From here I carefully made my way up to Hunterville before turning off onto Vinegar Hill and if you watch my slideshow you might note that there was still frost around in the shady patches and the road was a little damp in places. I still enjoyed the ride immensely and as I was just taking it easy I even stopped at the lookout for a few quick snaps. After my brief stop I carried on back towards Feilding before deciding to divert to Ashhurst to catch up with Meanie & Monie. This worked out good for me as not only did I get a coffee and a catch up but left with some nice snapper & cod from one of their fishing trips - looking forward to a cook up already! So once again a perfect day and a great little ride! I'm just back from a great few day's up at the farm. It's been good to catch up with my sister and her family and also to get out on the farm and pretend to help out with a few things. The below video is Stu and I popping out to check the new effluent line we hooked up and that the cows we moved in the morning were still where we left them. Both very important tasks and it was no fun whatsoever! Well I lucked out today! While getting tyres fitted to the DL I was given a Honda 600 Hornet to get around on. This is the second Hornet I ridden and they are a sweet little bike. What set this one apart from the previous one wasn't the colour (somehow they were both the same) but the rorty-snorty exhaust on it. Yes, the exhaust manufacturer had the check to call it a silencer! Actually it wasn't too loud but boy did it make a nice noise when you turned the wick up! I could see how you might get to like a wailing little four...a very nice little bike. Yes, I seem to be the person responsible for keeping the European motorcycle tyre manufacturers in business! Today was the day that I finally retired my poor old Anakee rear and Scorpion front and put on some more aggressive adventure rubber. First up, how did the old stuff do? Well I think that the Anakee was new when I bought the DL and since then it's clocked up 10,000 odd km and surely was showing every one of those kms. To it's credit though it still was hanging in there the other day on some wet gravel and I've only had one slide on the tar (very, very wet conditions on the Saddle one day). 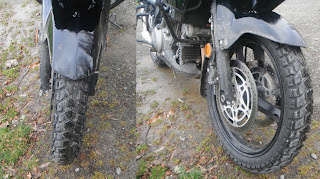 The Anakee has done a great job keeping the bike on the road in all sorts of conditions. 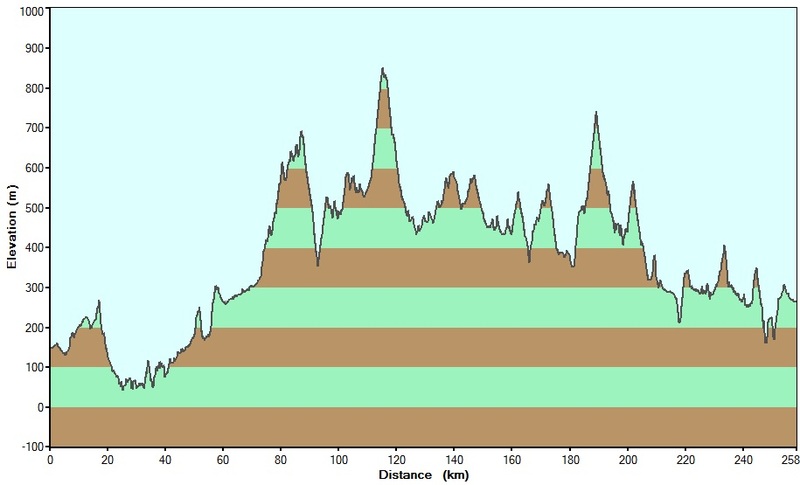 It's been in deep gravel (bike tends to float around in this stuff), mud (scary BRR ride), the rocks and clay of Takapari Road and all sorts of in between. Overall I'm very happy with how it's performed (although remember I'm an adventure noob) and very impressed with both tyres grip on wet tar - something I was worried about with adventure rubber on the road. The front Pirelli Scorpion Trail has also been a good tyre. It truly was a great tyre on tar - wet or dry - although I have probably been very hard on it as I really chewed out the sides (particularly the RHS). In the picture you can see the "triangulation" of the front. While it's nowhere near as aggressive as my new rubber (I'll just keep you in suspense a little longer) it has also surprised me off the tar and kept me out of the ditches and shiny side up for 7,800km (with probably still a couple of thousand left in it when changed). 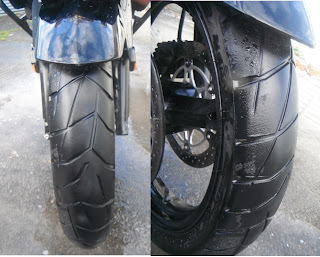 All righty then, the replacements...Well I've been surfing the net and checking out the Stromtrooper Forum to try and find a tyre that is just a bit better off road and off course still ok on road (and indestructible in terms of mileage for good measure). After a lot of mucking around I've finally gone for a set of Heindenau K60 Scouts. Anyway the guys got the tyres on pretty quick for me so I had no excuse not to go and give them a run. The roads were a little damp as I headed out of town so I took things quietly - brand new unknown tyres in the wet so probably not a good idea to give them heaps. Looking at the pretty abysmal looking skies I decided that the Pohangina Valley looked like the best place to head for so off I went. Right away I noticed a bit more vibration coming from the tyres but I had expected this and really it's just a bit more vibes from the bars and the seat to add to that from the big twin pushing me along. In town I could here a bit of noise from the front tyre too but not once out on the open road. 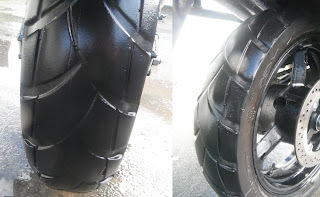 I also noticed that turn in (on tar) required slightly more effort but this just may be because the front tyre actually has a nice round profile whereas the worn Scorpion was missing this. After the rain we had yesterday I was actually hoping for some mushy conditions so I could really see how the new rubber handled it but when I turned up Finnis Road it looked like the road was in pretty good nick. Straight away I noticed the tyres felt great on the gravel. The front was felt very planted and the rear behaved itself very well - in fact when I attempt to slide the rear under power I was more often rewarded with grip and acceleration...so far so good. 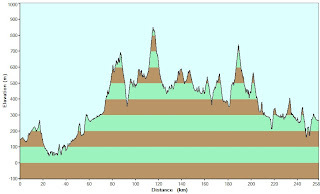 After the slower riding on Finnis Road and Zig Zag Road I decided that I needed to see how things went on faster gravel. I decided that since I was there I may as well do the now pretty familiar Pohangina Valley West Road but rather than do an out and back ride I decided to do a loop by taking the tar sealed Pohangina Valley East Road first. The tar was mostly dry so I got see how the K60's handled it and was pretty impressed. I pushed on a little in places and had absolutely no issues - nice! Then it was onto Pohangina Valley West Road again. The gravel here was in really good nick (in fact not much gravel in places) and the road is a lot more open than the previous gravel sections so I got to use all of the gears in the gearbox and really enjoyed what ended up to be a really short and sweet bit of gravel. The tyres were great and I'm really enjoying the feel from the front. I also noticed that I can brake a bit harder and the bike just stops rather than feels like it's going to float off the road - really nice. So it may have only been a 90km ride but I'm happy with the K60's so far. I now just have to find out how long they'll handle the jandle! But anyway, here goes. My first initial impressions of the PR3's was very good - they felt fabulous (new tyres after all) and very similar to PR2's. I also had absolutely no issues with them in the wet - but I expected as much as the 2's are great in the and the 3's were supposed to be another giant leap forward for Michelin. Last night as I was listening to the rain and checking out Kiwi Biker I noticed that someone had finally nailed the last tag and posted up a familiar looking location as the new tag. I decided that the tag would be mine come rain or shine. Luckily this morning there was a fair bit more shine than rain and so I set off out the valley towards Pohangina. Taking the DL meant that I could take a different route (although now quite familiar) than I think the original tagger took - his bike being a sports bike and so I ended up on Pohangina Valley West Road with the GoPro running in a new position. The road was in good nick following the rain last night and the poor old Anakee (new rubber coming this week) managed to keep the bike heading in the right direction so I was soon at the tag site - Totara Reserve camp ground. Then it was time to turn around and head back and I turned the camera around as well to try a different view for a change. I actually quite like this view - it's neat seeing the suspension working and the Anakee making tracks in the gravel. Without giving too much away (but probably giving a little away) I stopped somewhere along the way and took a snap for my new tag. And because I hadn't finished mucking around with the camera, I moved it again and took some pics of the return into town (damn could be giving a bit more away now). A beautiful winter's day don't you think? After a quick stop in town for some bits and pieces I got home and game my baby some TLC. A great way to use up a public holiday and the start of a week off for me - woohoo! All the best to Bruce Anstey and all the other riders! Keep it off the walls guys!